The authors of the Libek metastudy think their findings are particularly relevant to their native Serbia. The increase in economic-growth rates is very important for the Serbian economy. Serbia is the slowest-growing economy in the Balkans: Average growth rate in the decade after the recession (2008-2016) was only 0.83 percent annually. At the same time, the unweighted average growth rate for other Balkan countries (Albania, Bosnia and Herzegovina, Bulgaria, Croatia, Macedonia, Montenegro, and Romania) was nearly double that number, reaching 1.58 percent. All but two of the other Balkan countries score higher than Serbia in The Heritage Foundation’s 2018 Index of Economic Freedom. 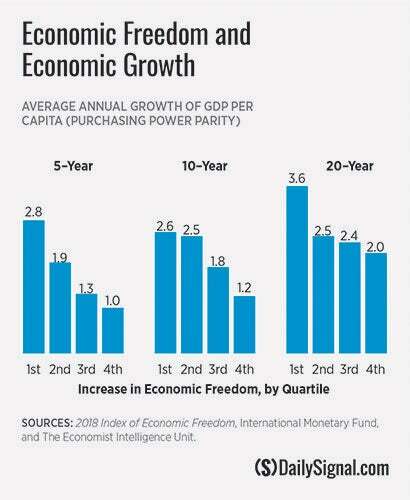 In fact, Heritage’s Index shows that on average, countries with the greatest increase in economic-freedom scores over 5-, 10-, and 20-year periods also have the greatest average annual growth in gross domestic product (GDP) per capita. The Serbian think tank’s findings are not surprising, and policymakers in Serbia and around the world should take them to heart. Advancing economic freedom is key to generating economic prosperity for the greatest number of people—in Serbia and everywhere else. This article has been updated to reflect that certain sentences were quotes from the Libek study.